A human resource manager serves as a liaison between management and employees. Within a business organization, a human resources director must facilitate positive relationships employees and senior management and ensure that employees are satisfied and happy. 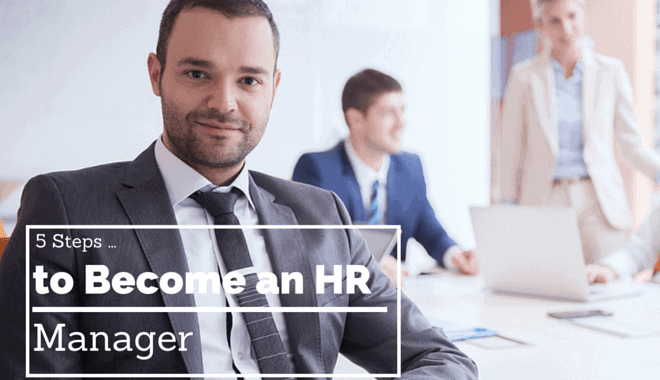 The road to becoming an HR manager can be long, but those who work in the human resources field report some of the highest levels of job satisfaction in North America. The first step is to earn your bachelor’s degree in human resources or a closely related field, like business administration. Most universities and colleges offer these degrees through their management or business departments. In the classes for these majors, you will learn about information technology, accounting, statistics, employment development, employment law, labor compensation, and labor management – among other subjects. Internships are a valuable component of the proper education. Internships are highly recommended for undergraduate students. Internships afford students the opportunity to gain invaluable experience, and they offer an excellent outlet for applying knowledge learned in the classroom in a real-world setting. Most internships are offered as a part of an academic program. If you do not have the opportunity to intern as an undergraduate student, the good news is that there is a plethora of companies that offer internships to recent college graduates. As an HR intern, you will develop and hone your interpersonal skills in order to effectively communicate between employees and management, and your position may require you to handle sensitive information. In 2007, the Society for Human Resource Management conducted a survey among HR professionals, and 96% of those surveyed said that internships provided essential preparation for an entry-level human resources position. Professional organizations offer numerous benefits for those who decide to join them. Two of the most popular human resources management professional organizations in the United States are the National Human Resources Association and the Society for Human Resource Management. Members of both organizations enjoy educational benefits (e.g. exclusive access to certification prep materials), conferences and seminars, and online forums where members can network with one another and create professional contacts. A growing number of prospective employers are looking for HR managers and directors who are professionally certified. There are multiple professional certification designations within the HR field. The two certifications that employers desire the most are the Certified Employment Benefits Specialists (CEBS) and the Professional of Human Resources (PHR), with Senior Professional in Human Resources (SPHR) following a close third. The CEBS certification process consists of eight different modules that specifically focus on group benefits, such as retirement and compensation. Individuals who take this certification test can choose to focus on a specialty track, like Compensation Management Specialist or Group Benefits Associate, among other options. Likewise, the PHR test requires a candidate to study six different modules, which include employment, workforce planning, employee relations, labor relations, and risk management. Before being allowed to take the PHR test, candidates must meet specific eligibility criteria. Exam lengths will vary by certification state and program. If you wish to transition into the management side of human resources, additional training and experience will be required. According to the Bureau of Labor Statistics, specific positions, like labor relations or industrial relations, require graduate level education. Masters’ degrees can be earned at a broad level, like organizational leadership, or you may opt to choose a more specific discipline, such as employment and labor negotiations. The master’s level tends to offer a wide range of interesting specialties, like personnel administration or management/employee negotiations. The courses you take while pursuing your master’s degree will teach techniques in strategic planning, project management, arbitration, mediation, and contract negotiation. After following these steps, now will be the time to begin seeking higher paying work. With the appropriate certifications, a graduate degree, and a few years of experience, this will provide you with an edge over your competition. Good starting points for your job search will be online job boards and networking through peers and former coworkers.